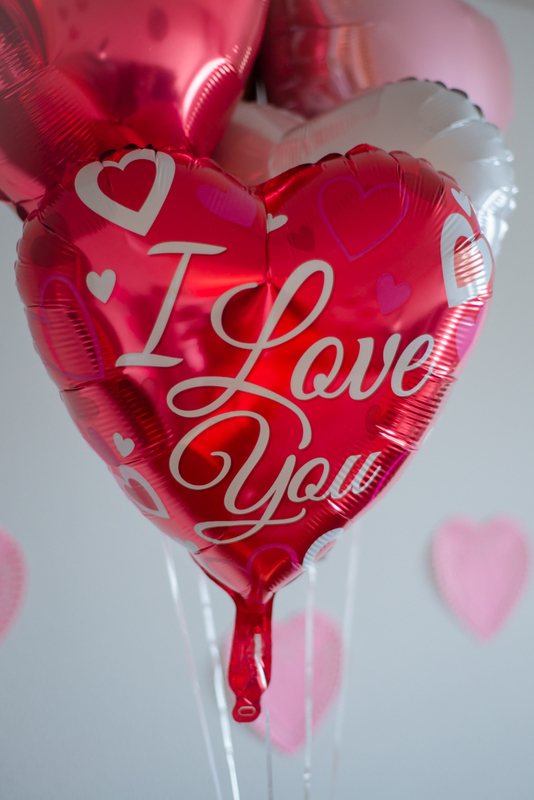 Valentine’s Day comes just once a year! It’s such a fun holiday to decorate for, and it can be done pretty inexpensively, too. 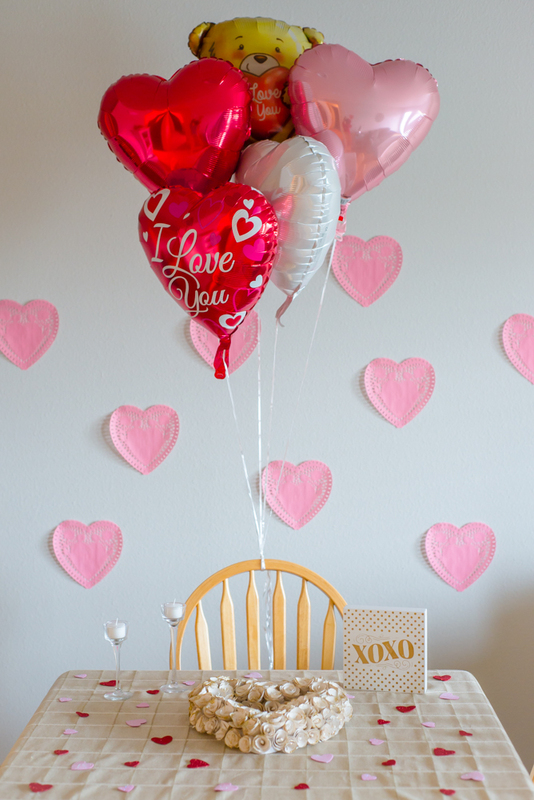 Today I’m going to show you how I put together our Valentine’s Day decor for under $20! 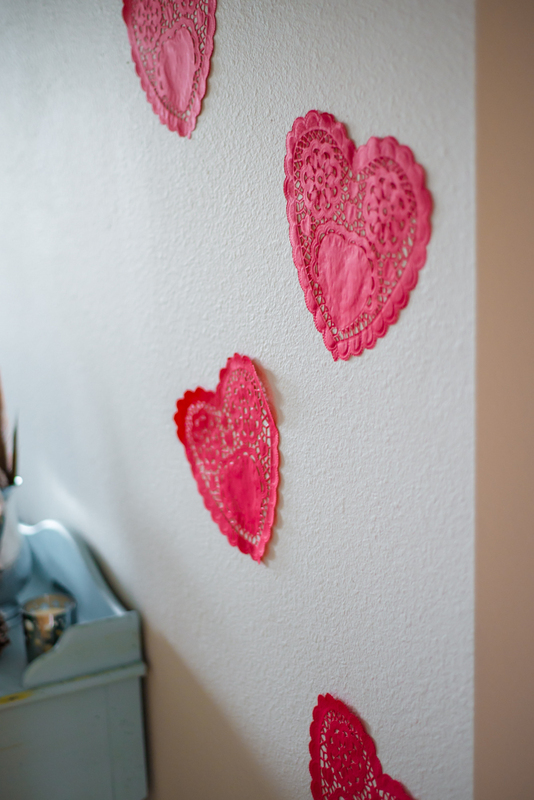 Since this is our first married Valentine’s Day, I knew I wanted to do some decorating. I also knew that I didn’t want to spend much money. 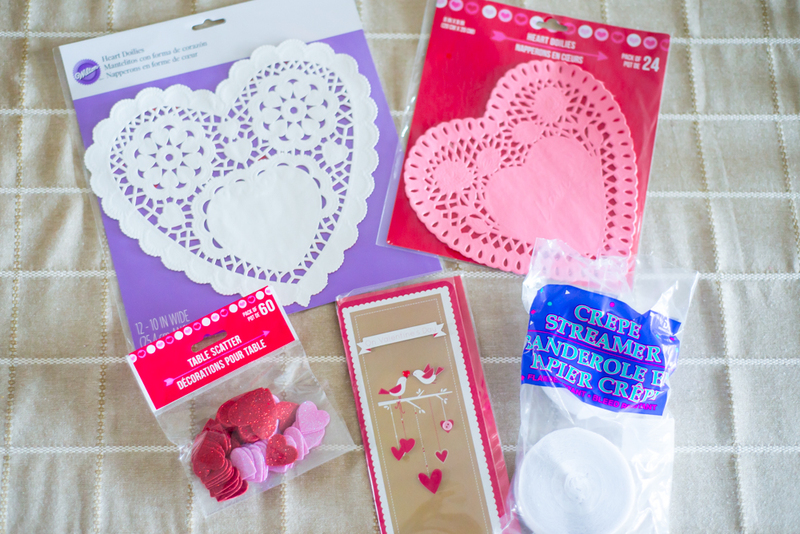 Enter: JoAnn’s Valentine’s Day decor 70% OFF sale and the Dollar Tree. On Thursday morning, my sister-in-law Aimee and I took a trip to our local JoAnn’s and Dollar Tree. 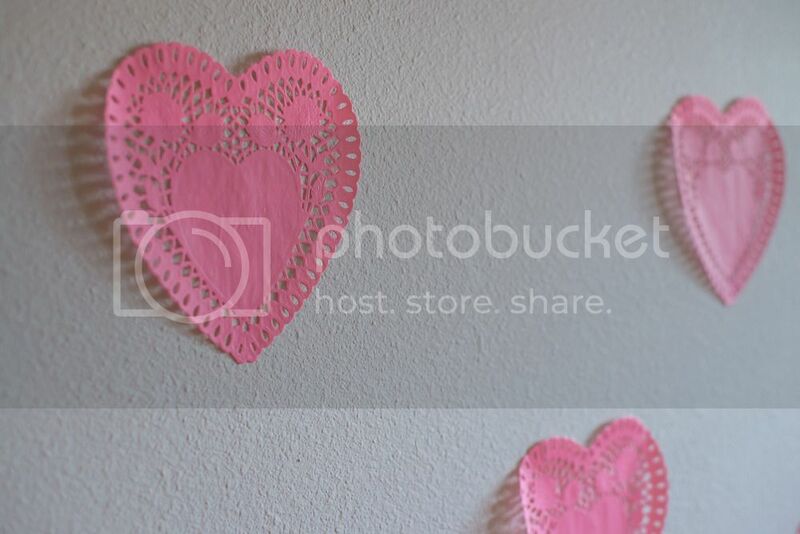 I had been in JoAnn’s the week before and noticed their Valentine’s decor was 40-50% off. That’s a good sale, but the decor was still more than I wanted to pay. I wandered around the shelves looking for inspiration and ideas, picking up a few things I really liked. 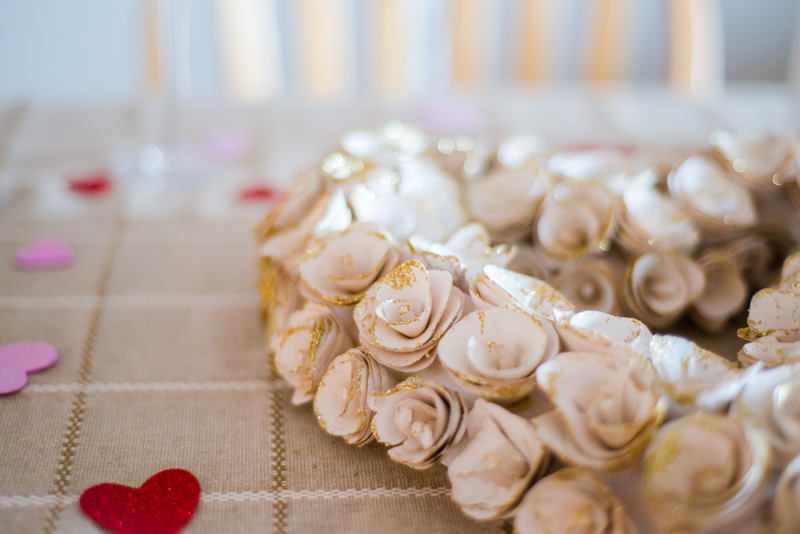 Among those was a shimmery, bright red heart wreath I thought I could use for my table centerpiece. 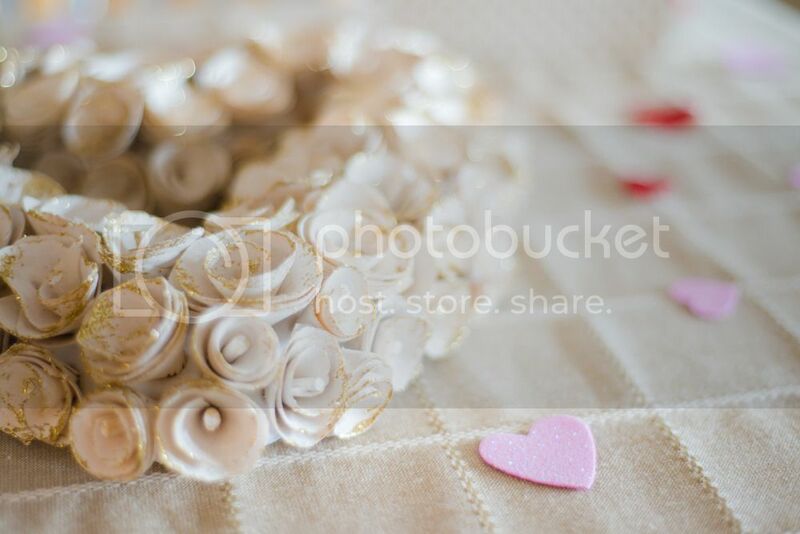 However, when I walked over to the floral section to see if there were any Valentine’s themed flowers on sale, I spotted a gorgeous cream and gold heart wreath. 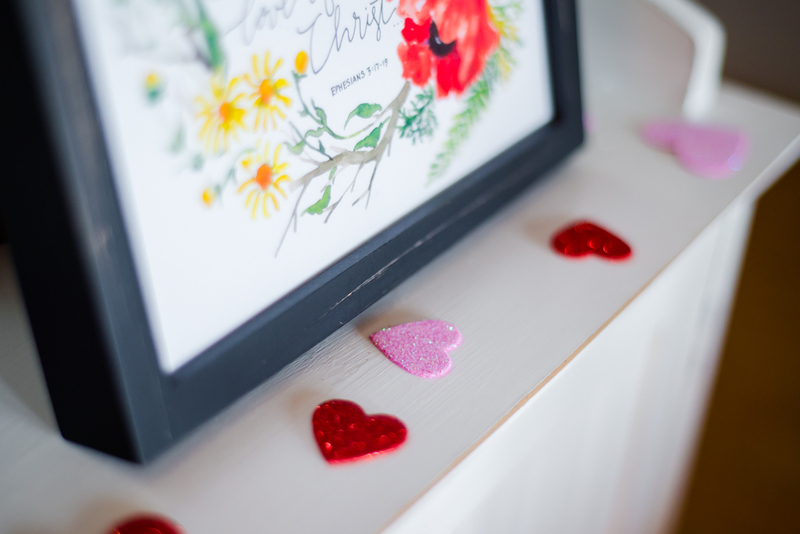 I knew that I’d love to display it in our bedroom after it served its purpose as our table centerpiece, so I didn’t hesitate! It was $30 retail, marked down to $9, so I was doing a little happy dance in the aisle! 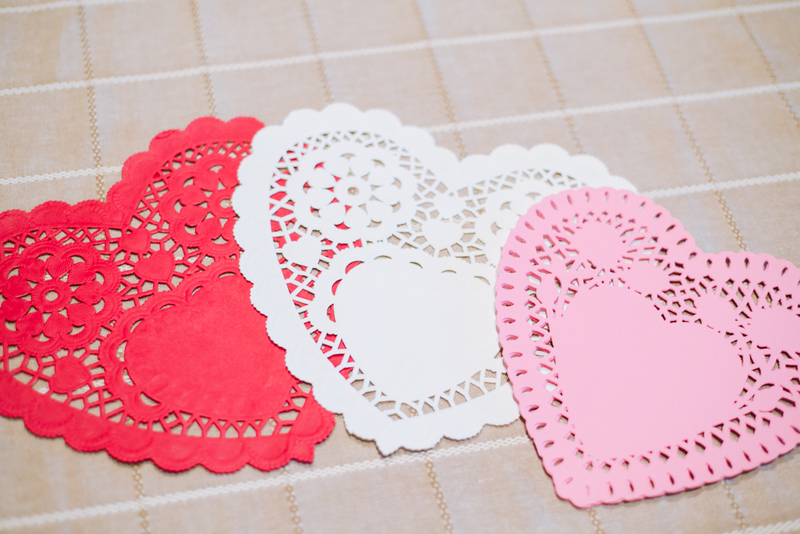 1 package of 12 Wilton heart doilies (6 red, 6 white) for $1.20. 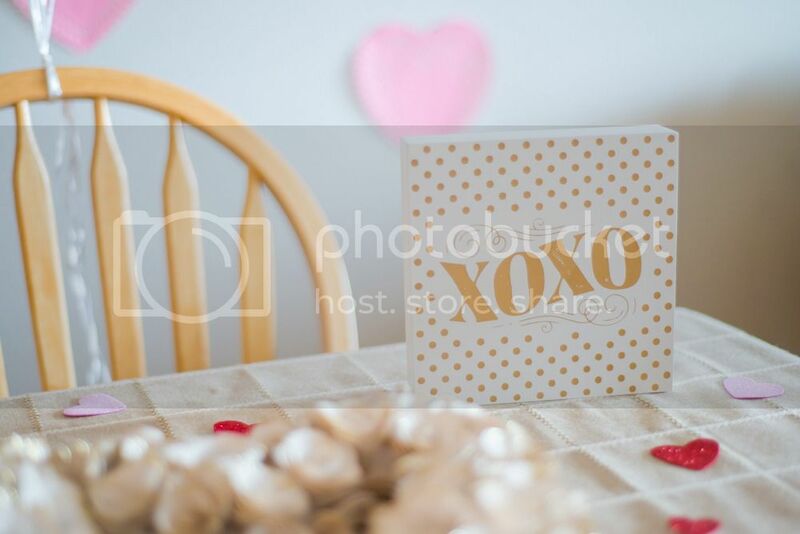 A cute XOXO wooden sign for $3. 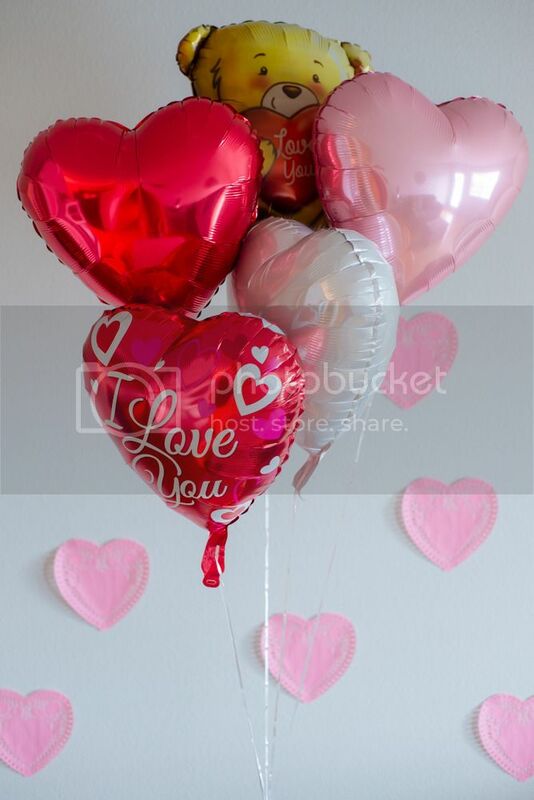 I also plan to use this in our bedroom after Valentine’s Day! 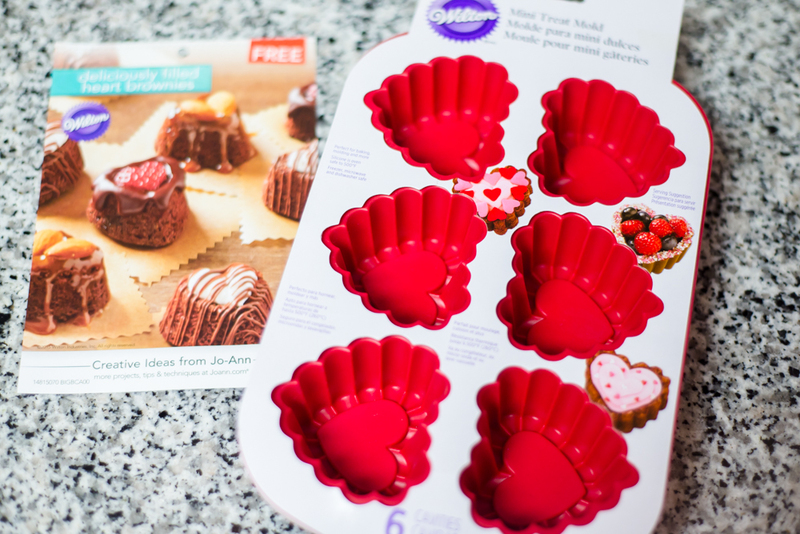 A Wilton lacy heart-shaped silicone baking mold for $5, marked down from $17. (I’m not including this in my decor cost.) I’m planning to use it as a chocolate mold and to bake some gooey gluten free brownies. Leaving JoAnn’s, I was pretty excited about my finds! We decided to stop in at the Dollar Tree to see if they had any Valentine’s Day decor left. To my surprise, they still had quite a few decor items to choose from. Much of what the Dollar Tree carries is cheap looking, but I’ve found that some of their items are really adorable. Plus, it’s pretty hard to beat the price tag! 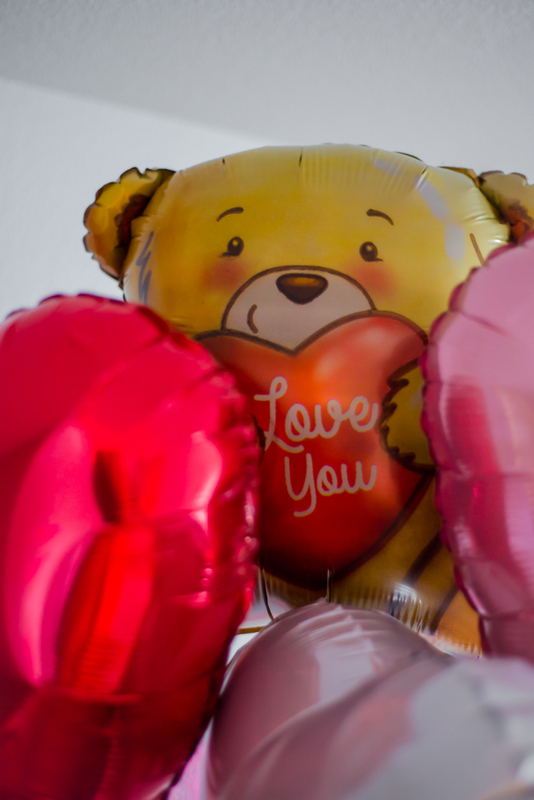 Before we left, I couldn’t resist grabbing a heart-shaped balloon. And then another… and another… and another…. and then that super cute bear balloon! So I left with 5 balloons in hand and the excitement level of a 5 year-old. All in all, I spent less than $20 on Valentine’s Day decor from both stores, and $7 on non-decor items. Once I got home, I hid everything in our bedroom during the lunch hour while Benj was home. Once he’d gone back to the office, I got to work. I have to say, I had a blast putting everything out. 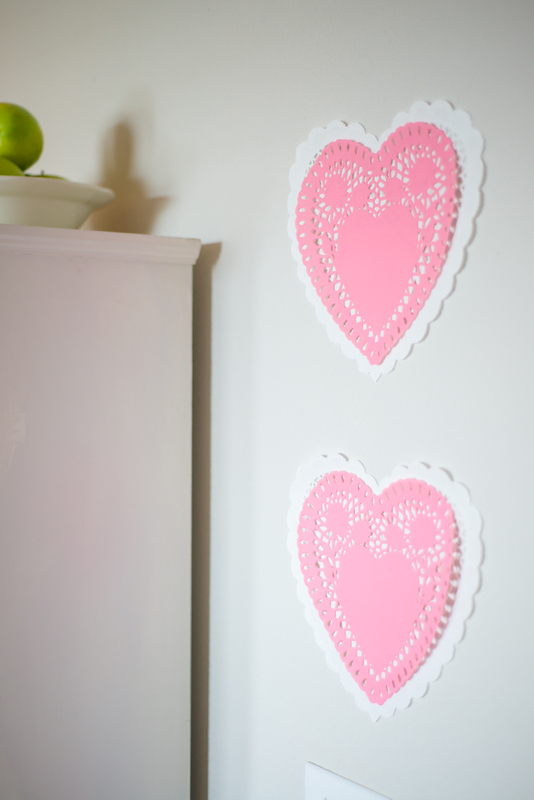 I took some double-sided adhesive squares and stuck all of the heart doilies to the walls. Some of the doilies I layered, but most I just used singly. I also placed some around the twinkle lights in our bedroom. On the table, I arranged the wreath and XOXO plaque. 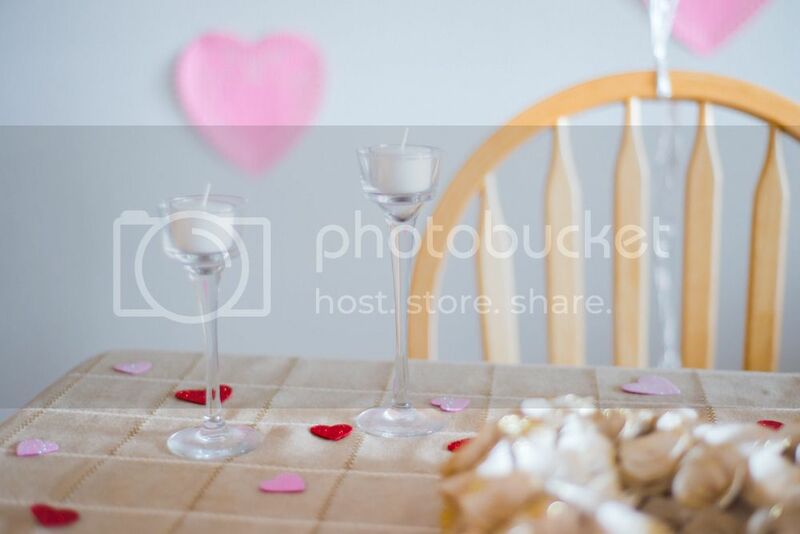 Next, I sprinkled the table scatter hearts around. I then pulled out a set of two-tiered glass tea light holders from my mom (again, Dollar Tree, people!) and set them on the table. 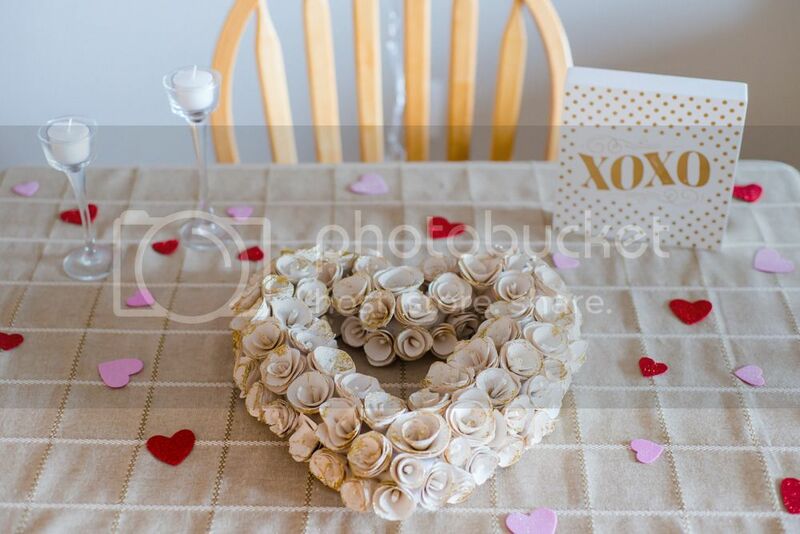 I also plan to hot glue a few of the smaller table scatter hearts to some tea lights for additional romantic candle lighting. They’ll add a nice ambiance during dinner. 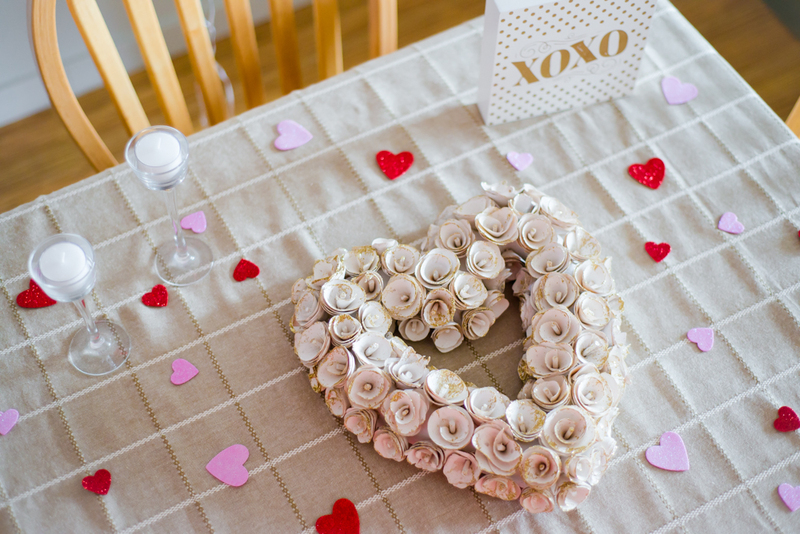 And there you have my Valentine’s Day decor and table display for this year! I had so much fun putting it all together. Even though I feel like I’m just starting to get the hang of decorating, I’m really happy with the way everything turned out. Benj was so surprised, which made it worth all of the effort! Side Note: The mug came as a free bonus from the coffee shop up the road when Benj purchased a bag of one of their roasts! He picked it out of several designs for me, and I happen to think it’s pretty cute. 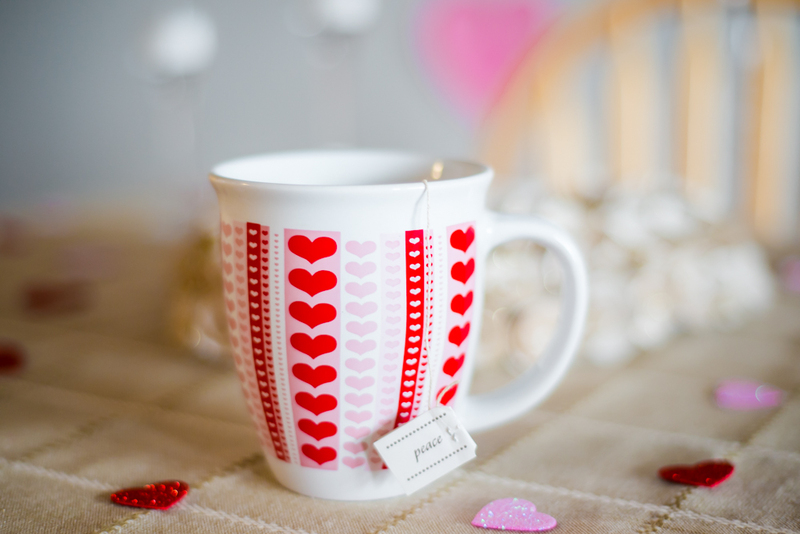 How do you decorate for Valentine’s Day? What thrifty ideas do you have? Leave a me a comment below. I’d love to know! 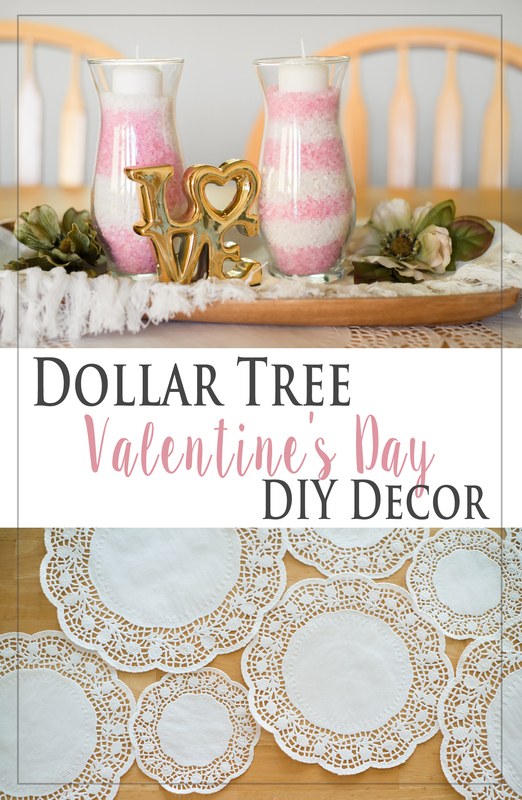 Update: Check out my 2017 Easy Dollar Tree Valentine’s Day DIY Decor Ideas! Everything looked so nice. I liked the tablecloth too! Happy first Valentine’s together.